Previously overlooked patterns in the cave art of southern France and Spain suggest man might have learned written communication 25,000 years earlier than we thought. These underground galleries, found mostly in France and Spain, also turn out to be remarkably old. The works at Rouffignac have been dated to around 13,000 years old, while those at nearby Chauvet and Lascaux are thought to be more than 30,000 years old. This testimony on rock walls – in daubs of ochre and charcoal mixed with spittle and fat – shows that our hunter-gatherer ancestors could depict the world around them in a startlingly sophisticated way. As the art critic John Berger once said of these painters, they appear to have had “grace from the start”. There is another aspect to this art that often escapes attention, but which is now providing scientists with fresh insights into our recent evolution. Instead of studying those magnificent galloping horses and bisons, researchers are investigating the symbols painted beside them. These signs are rarely mentioned in most studies of ancient cave art. Some are gathered in groups, some appear in ones or twos, while others are mixed in with the caves’ images of animals. There are triangles, squares, full circles, semicircles, open angles, crosses and groups of dots. Others are more complex: drawings of hands with distorted fingers (known as negative hands); rows of parallel lines (called finger flutings); diagrams of branch-like symbols known as penniforms, or little sketches of hut-like entities called tectiforms. In total, 26 specific signs are used repeatedly in these caves, created in the millennia when Europe descended into – and emerged from – the last great Ice Age. But there is more to von Petzinger’s work than the study of the appearance of the symbols. Working with her colleague April Nowell, she has created a database of all the signs found in more than 200 caves and other shelters in France and Spain. The aim was to study where and when they were first used, and in what combinations, and to compare them with markings found on other ancient artefacts. The results are startling, for the database shows many symbols are frequently arranged in specific clusters repeated over and over again in different caves (a negative hand with finger fluting, for example). “What we found was quite remarkable,” says von Petzinger. “There is definite patterning in the way these signs were used.” In other words, she and Nowell have shown that these markings are no mere abstract scribbles but appear to be a code that was painted on to rock by the Cro-Magnon people, who lived in Europe 30,000 years ago. They seem to have found evidence that some form of written language was being attempted by our Stone Age ancestors, an idea that – if substantiated – would push back the recognised birth of writing from about 6,000 years ago, as produced by the first agrarian societies, to an incredible 30,000 years ago. At this time, there were no red deer in France and it is thought the necklace teeth came from Spain, possibly as items of trade between different tribes. Obsidian and other goods are also known to have been exchanged by groups from these regions. But if the necklace pieces arrived by this route, were the symbols carved on to them before or after they arrived in France? If it was the former, this suggests a crude form of written language may have already linked the different groups of Cro-Magnon hunter-gatherers then living in southern Europe. Perhaps the symbols make up the letters of a name or it’s possible they contained a religious message. Their work has one other important aspect. Those strings of symbols seem to have been in widespread use 30,000 years ago, as modern humans spread through Europe. When did modern humans first develop and use them? Did Homo sapiens invent them after we arrived in Europe or do they have an even older lineage? Is it possible that our ancestors carried them out of their African homelands when they first began their global diaspora, about 70,000 years ago? The answers to these questions reveal a division in the world of palaeontology and anthropology. On one hand, scientists such as Richard Klein (Stanford University,) Nicholas Conard (Tübingen University, Germany,) and others argue that human behaviour – involving use of complex symbols, art and sophisticated tools – did not appear until about 35,000 years ago. Pointing to works such as those at Chauvet, Lascaux and other caves, and to discoveries that suggest that musical instruments, boats and religious objects were first made around this time, proponents of this theory argue that an abrupt change in our behaviour – possibly due to mutations in our DNA that affected our intellect and brain structures – occurred as we began to pour into Europe. These changes then triggered a cultural revolution that later spread round the world. Other scientists disagree, among them Alison Brooks (Smithsonian National Museum of Natural History, Washington,) and Prof. Peter Mitchell (Oxford.) They argue that there is plenty of evidence to indicate that humans had reached their full intellectual potential long before they left Africa. Recent discoveries made in South Africa include tiny flint points, which may be the first arrows ever made, and beautifully crafted pieces of ochre that suggest works of arts and jewellery were being created there 70,000 to 90,000 years ago. Does the work of von Petzinger and Nowell shed any light on this division? 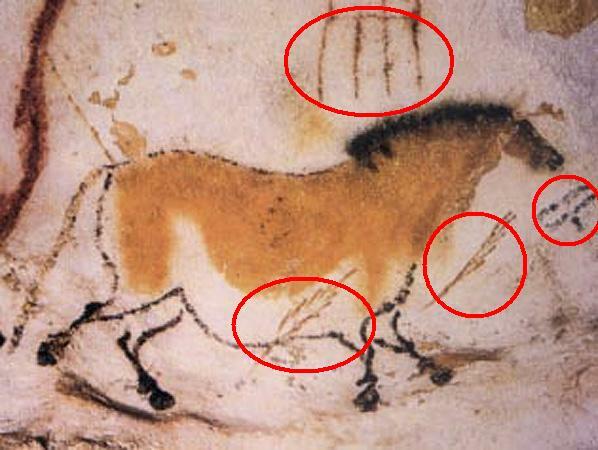 Do any of those symbols at Lascaux, Chauvet and Rouffignac appear in earlier forms of art found in South Africa? According to von Petzinger, the answer is probably yes. Many of the swirls, crosses, circles, open angles and crosshatches seen in France are also found in far earlier works from Africa. For example, the open-angle symbol can be seen on engravings at Blombos cave in South Africa, where artistic artefacts about 75,000 years old have been found.